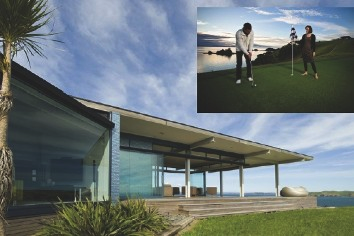 Hurakia Lodge on Rakino Island, Auckland has installed a spectacular new character golf course. The stunning one green golf course with three different tee positions to suit easy (85 metres), intermediate (110 meters) and advanced (150 metres) has been created just a few steps from the luxury lodge. Guests at this idyllic island retreat can now practise their golfing skills while taking in the fabulous, uninterrupted sea views. The green also has four holes to allow for putting practice. 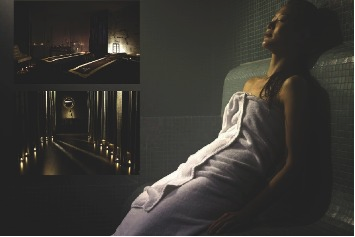 Clubs are included in the lodge facilities at no extra cost. Along with the new walking and mountain bike track around the lodge’s exclusive 20 acre peninsular property, and the four viewing platforms perched dramatically overlooking the ocean, the character golf course offers guests a further opportunity to absorb and admire the vast and dramatic panorama. Hurakia Lodge is an exclusive-use villa on Rakino Island in Auckland’s Hauraki Gulf. A luxuriously secluded escape, accessible only by helicopter or boat, the villa boasts spectacular sea views and tranquil surroundings. With island activities such as mountain biking, fishing, kayaking and now golf available, Hurakia Lodge is the ideal island retreat, comfortably sleeping up to ten people.